I don't run hosted monitoring as a service, I just happen to do some monitoring for a few (local) people, in exchange for money. The IMAP probe would connect to an IMAP/IMAPS server. Optionally it would login with a username & password. Oops. Anyway that bug was fixed promptly once it manifested itself, and it also gained the ability to validate SMTP authentication as a result of a customer user-request. Did more geekery with hardware. Purchased a nicely packaged ePaper + battery + charger device, via a link in an email discussion. Had a fun time in a sauna, on a boat. There were also other water-sports at Laguuni. If you read a remote URL and convert the contents to PDF then be damn sure you don't let people submit file:///etc/passwd. I've talked about this previously. Made plaited bread for the first time. So I challenged myself to writing a BASIC intepreter over the weekend, unfortunately I did not succeed. What I did was take an existing monkey-repl and extend it with a series of changes to make sure that I understood all the various parts of the intepreter design. Added support for single-line comments. For example "// This is a comment". Added support for multi-line comments. For example "/* This is a multi-line comment */". Expand \n and \t in strings. Allow the index operation to be applied to strings. For example "Steve Kemp" would result in S.
For example "type(3.13)" would return "float". For example "type(3)" would return "integer". For example "type("Moi")" would return "string". Once I did that I overhauled the built-in functions, allowing callers to register golang functions to make them available to their monkey-scripts. Using this I wrote a simple "standard library" with some simple math, string, and file I/O functions. // wc -c /etc/passwd, sorta. let run = true;  // still reading? // math.random() returns a float between 0 and 1. Maybe next weekend I'll try some more BASIC work, though for the moment I think my monkeying around is done. The world doesn't need another scripting language, and as I mentioned there are a bunch of implementations of this around. Recently I've had an overwhelming desire to write a BASIC intepreter. I can't think why, but the idea popped into my mind, and wouldn't go away. So I challenged myself to spend the weekend looking at it. Parse the input into tokens, such as "LET", "GOTO", "INT:3"
This is called lexical analysis / lexing. Taking those tokens and building an abstract syntax tree. Walking the tree, evaluating as you go. The naive way of approaching this is to repeat the whole process for each line. So a program would consist of an array of input-strings each line being treated independently. Anyway reminding myself of all this fun took a few hours, and during the course of that time I came across Writing an intepreter in Go which seems to be well-regarded. The book walks you through creating an interpreter for a language called "Monkey". Unfortunately this crashed. It crashed inside the body of the loop, and it seemed that the projects I looked at each handled the let statement in a slightly-odd way - the statement wouldn't return a value, and would instead fall-through a case statement, hitting the next implementation. So I reported this as a meta-bug to the book author. It might be the master source is wrong, or might be that the unrelated individuals all made the same error - meaning the text is unclear. Anyway the end result is I have a language, in go, that I think I understand and have been able to modify. Now I'll have to find some time to go back to BASIC-work. I found a bunch of basic-intepreters, including ubasic, but unfortunately almost all of them were missing many many features - such as implementing operations like RND(), ABS(), COS(). Perhaps room for another interpreter after all! Tags: golang, intepreters, monkey. | 4 comments. I guess I should have known that! So for the moment that's what I'm using to submit metrics from my hosts. In the future I will spend more time investigating telegraf, and other "modern" solutions. 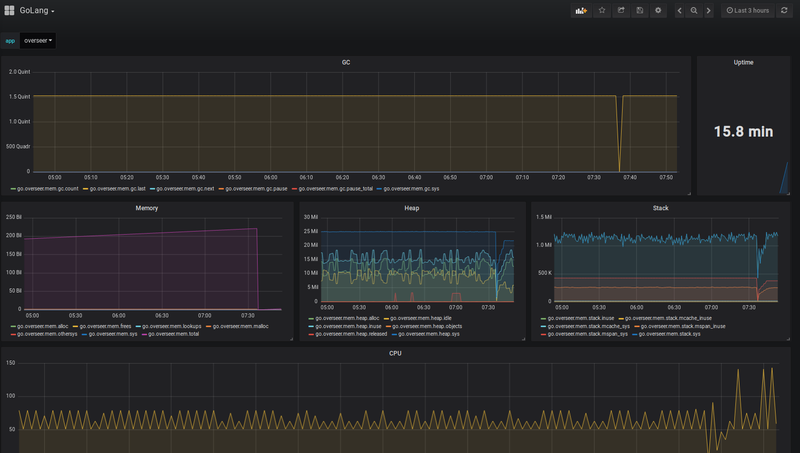 Still with collectd-core installed we've got the host-system metrics pretty well covered. Some other things I've put together also support metric-submission, so that's good. Now your application will be running as usual and will also be submitting metrics to your central host every 10 seconds or so. Metrics include the number of running goroutines, application-uptime, and memory/cpu stats.